We’ve spent the last couple of weeks De-cluttering, Categorizing, and ‘Organizing’ our Office Space. It is now time to continue ‘Organizing’, while setting up any ‘systems’ you need. We will have to talk generically here, since each of you has a different type of business. When you have put everything away, I highly suggest labeling what you’ve done. Often times I even create a ‘map’ for an office and a ‘key’ for the file cabinet. This is especially beneficial when you have other employees or people helping you in your office space. 2. Communication with clients, fellow employees, or business contacts- follow up!!! 5. Filing- purging, archiving, etc. By the end of today, you should have every category in your office put away, whether it is in bins, boxes, files, shelves or cupboards. I suggest labeling as well. In addition, you should be following through daily on your ‘to-do’ list. Draw up a map or a key so you know where things are. Practice giving directions on where things ‘live’ with a friend, family member or employee. Direct them to something when you are not in the office, and see if they can find it. 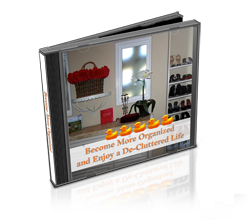 This is a sure proof way to be ‘de-cluttered’, more organized, AND increase your productivity— which results in increased profits! * for more information on this, and on the career of being a Professional Organizer, mark your calendar for May 10-13, 2012 for my Organizer Licensing and Certification Training or e-mail me at missy@theorganizedconnection.com for more information. Missy, This is so true. Thanks for setting up all of the above systems at my office! There was no way that I could have gotten my office, and my life, organized without your help. Holy Crap! What a difference it has made in my productivity! Now that my office has stayed organized, I have used that leverage to make the rest of my employees get organized as well. There is nothing like leading by example! Thanks for the endorsement! Seriously though, you were committed and ready!- not to mention a blast to work with!